In conjunction with a kitchen remodel I want to create a real outdoor entertainment space out of the cracked and chipped patio that is immediately in front of our kitchen with its motley crew of overly heavy and faded teak furniture. Even the cats wish I would do something. I keep whining about the craftsman style windows I installed 15 years ago. Very expensive as well. A design mistake that must go. Tired dirty looking furniture. Of course I took this picture on the grayest of mornings without the pretty green cushions. At #PSMW, I wandered across Outside/In Furniture. They make, shall we say, tribute furniture to classic designs of the 1950's and 1960's. 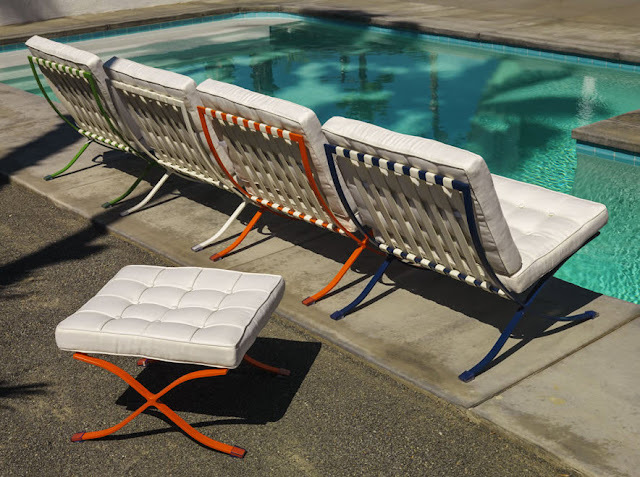 Outside/In is located in Palm Springs and names their furniture collections after iconic Palm Springs neighborhoods. This is what I want my patio to look like, minus the pool. 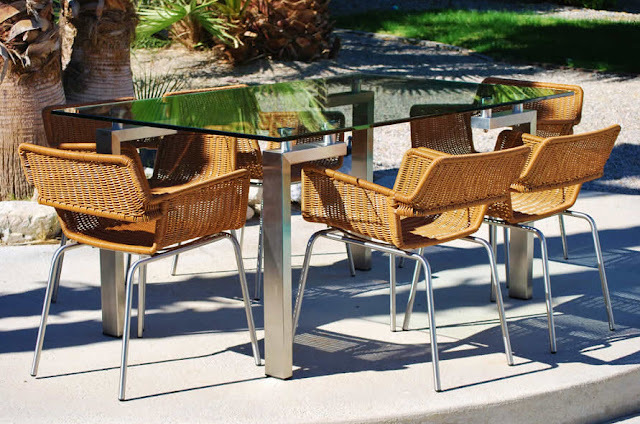 I have looked, for a long time, to find classic mid-century modern furniture in an outside durable design. Of course, these beautiful pieces aren't cheap, but they are the icing on the cake to the ultimate design I would like for our kitchen and patio living space. Nice, huh? A girl can dream. Note: This post not sponsored in any way, shape or form by Outside/In, just a product of my unbridled enthusiasm. Noticed a link to outside in is incorrect. I really like this furniture. Considering I just spent last weekend putting together adirondack chairs I got on Rue la la, I'm dreaming, too! All of the furniture is yummy! But there are no prices on the site - which usually means I can't afford it. I know, if you have to ask... I didn't gasp (much) when I saw the prices. Love those chairs. Soooo sleek. A word in defense of the teak--it's virtually maintenance free, as opposed to some of the items shown above. As someone who has a glass-topped outdoor table. ALWAYS dirty except for the first half hour after I clean it. Just cause you can't see the dirt doesn't mean it isn't there. HAHA. Good point--you just hit upon my philosophy for housecleaning. Just looked at your wonderful house tour. My opinion is off the charts. What a cool brutalist home. Never seen anything like it. My Mom loves your "Paint the Teak" idea. I think I would like to extend their lives so I am going to give it a go. Stay tuned! Hi Rebecca, I too have been wanting to solve my outdoor furniture issues. Hard to get something that can brave the elements and still hold it's good looks. 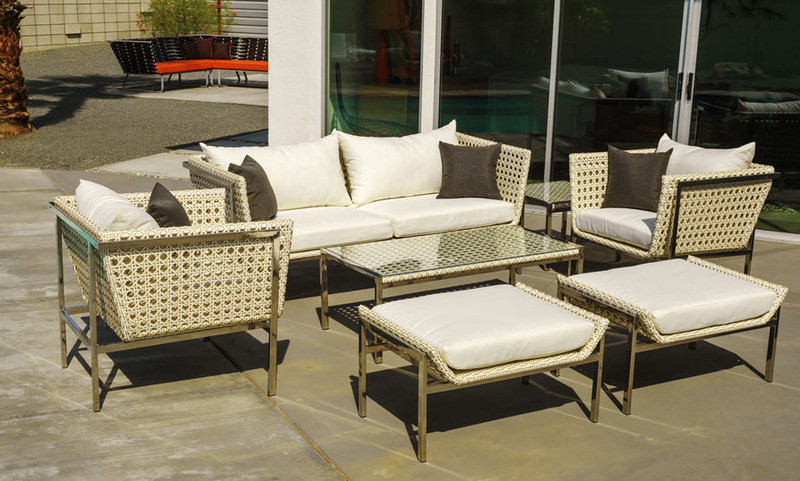 I also find most outdoor furniture and sets too big and cumbersome. I really like the chairs shown by the pool. I could take the pool too...with a daiquiri!